Today I bring you a most adorable product ever! 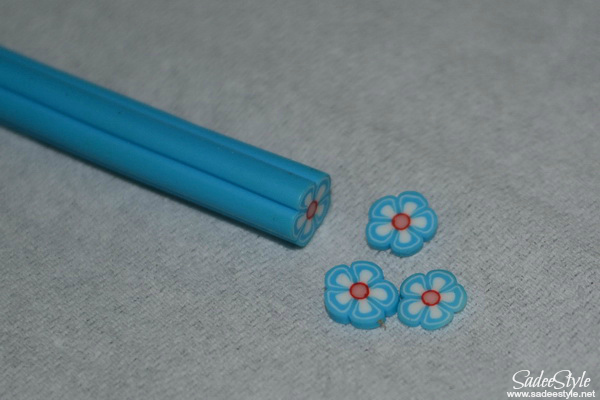 See how cute these fimo canes are? In case if you don't know what fimo canes are. 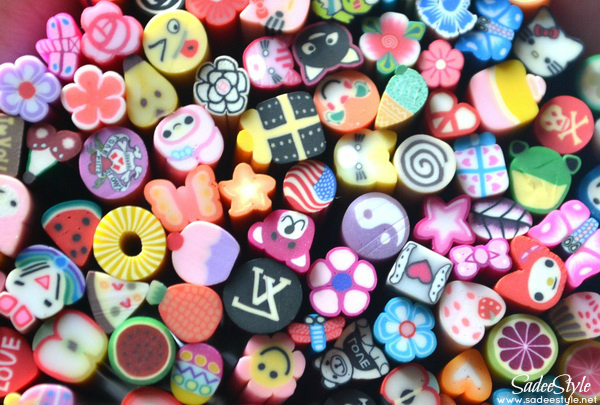 These cute fimo canes sticks actually made with polymer clay, what you would do is cut these canes into very thin slices and decorate them onto your nails. These instantly caught my eye when browsing on the BornPrettyStore and I knew I just had to have them. They come in several different designs in flowers, hearts, circles, cats, dogs, faces, smileys, fruits, bug and butterflies. The length is 50-55 mm. The diameter is 3-5 mm. You can cut the nail art fimos into thin or thick pieces as you like, and glue them on your nail. Aren't they cute? The set I ordered from Bornprettystore includes 100 most popular fimo as shown in the picture. You will get bunnies,butterflies, flowers, fruits, leafs, tidy bear, heart and kitty faces. Well, that's my first attempt to apply these fimo on my nails and I think i'm quite successful. It was really easy and fun to do. The set I ordered from bornprettystore wasn't included the cuter/blade to slice the fimo so I used the regular shaving blade to slice them into thin pieces and it worked absolutely fine. 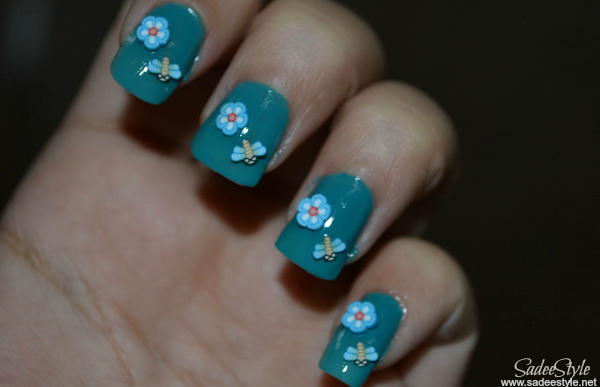 I love the flowers and butterflies so picked these designs to decorate my nails. First I applied the two coats of OPI fly as a base coat after it dried i applied a rapidry coat on top of the polish, while wet, I pressed a fimo on the nail, but you can use a nail glue to stick the fimos on and at the end i applied the rapiddry top coat again for exrta shine and to seal the fimos nicely. 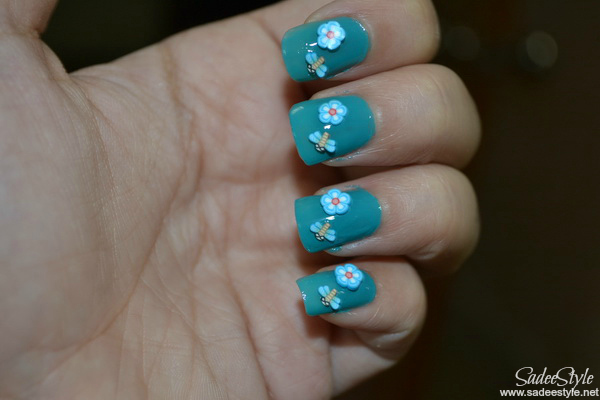 I absolutely love the design comes up on my nails, it looks very refreshing and cute. I am so happy with them. You can order your own set from bornprettystore they have huge range of nail art products on their website also they provide free worldwide shipping. They're so fun to look at. They came up really cute on nails. Not just you can put them on your nails also you can decorate your mobile, gadget, jewellery box and laptop with these cute fimos. Oh my gosh these look SO SO cute. aaaa these are sooo cute!! Idk why but I never had a heart for nail art. However, i loved the beads necklace that your wrote a review on. It was gorgeous but isn't it a little expensive for 15 pounds?!? Soo cute! Love the opi!! We hope we see you again in our blog! How lovely is that! Wow...!! Love those super cute stickers! They look like candy!!!! Your blog is amazing. Great job! Following you now. Would appreciate if you follow back! I'm familiar with femo, but haven't heard of it being used with nails...what a fun idea. I'm following with gfc. Happy 2013!